Enjoy a more comfortable and luxurious lifestyle with home remodeling services from Specialty Construction & Restoration LLC in Hattiesburg, Mississippi. We provide a variety of services to update your house, including bath and kitchen remodeling as well as additions. What sets us apart is that we provide a lifetime warranty on the workmanship for as long as you own the house. We hope you also consider us to renovate your business property. Add function and character to the most essential room in your home. We do anything from giving your kitchen a facelift to a complete redesign. We install custom cabinets, counter tops, appliances, and do tile work. These services are also essential in the event that disaster strikes. Call us for a free consultation and written estimate. Give your bathroom a new look with our bathroom remodeling services. Accent your bathroom with new light fixtures. Improve its functionality with new cabinets and counter tops. Give it a more contemporary look with new tile and custom glass work for your shower. An updated bathroom adds value to your home, especially if you are considering selling. Create a new space that you can enjoy entertaining in. The benefit of choosing us for adding a home addition to is that we will come to you and draft the blueprint with you. 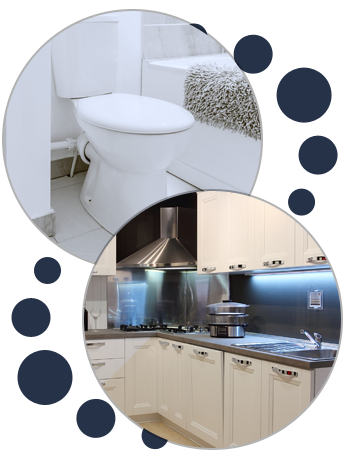 We have more than 35 years of experience in adding new rooms to homes and handling the plumbing and electrical side as well. Whether you're looking to add a sunroom or need to expand your home for your growing family, we are licensed, bonded, and insured to help you transform your house.